On the pitch, Manchester City impressed everybody last season. Now let’s take a look behind the scenes – on the men who own the club. The trailer for the forthcoming Amazon Prime documentary ‘All or Nothing: Manchester City’ is out and it’s hard to escape the feeling that they came mighty close to calling it ‘Death or Glory: Manchester City’s Band of Brothers.’ Overlaid by a drum-heavy score, it features General Pep Guardiola drawing up his battle plans, exhorting his weary and injured troops in the dressing room – “we are close, we are so close” – before proudly surveying his platoon’s triumphant victory away to Stoke City. Regrettably, Netflix have yet to approach me with an offer to fund my own counterproject, ‘The Men Behind Manchester City’, leaving me with no option but to reveal details of the second episode, provisionally titled ‘The Kids Are Not Alright.’ Whereas Amazon’s documentary draws on the tone and genre conventions of the modern war movie, viewers of my project are more likely to see parallels with themes from 1980s American soap-operas, although ironically it is my documentary that contains all the death and the stomach-churning violence. Episode 1 was based around the bombshell revelation that Manchester City is not actually run by Sheikh Mansour Al Nahyan but by his more powerful and more dangerous older brother, Sheikh Mohammed bin Zayed Al Nahyan, and it argued that the club’s rise to the top of the European game reflects the efforts of a gang of cash-hungry, blood-thirsty statesmen to extend their network of power and influence, aided and abetted by shape-shifting public relations advisors. Episode 2 brings our other key actors into play: Abu Dhabi’s junior partner in the United Arab Emirates (UAE), Dubai; Abu Dhabi’s regional ally Saudi Arabia; and their hated Gulf neighbour, Qatar. It’s a tale of jealousy, quarrels, cruelty, and high-stakes competitive camel-racing, and if episode 1 left you feeling a bit uneasy about the men trying to take control of professional football, buckle up. Pep Guardiola and Sergio Aguero with Sheikh Mansour Al-Rahyan, the official owner of Manchester City. A little bit of background is necessary to explain why Saudi Arabia and the UAE hate Qatar so much. The antipathy largely hinges on how the unelected rulers of these fabulously wealthy petrostates regard the threat of political Islam: Qatar is generally quite tolerant of groups like the Muslim Brotherhood, and their news network Al Jazeera was generally favourable to those groups during the Arab Spring uprising that began in 2010 and the counter-revolutions have thrown the Middle East into bloody turmoil; Abu Dhabi regards the Muslim Brotherhood as a fifth column, and anyone who sympathises with them can expect to be arrested, tortured and thrown in jail; Dubai goes along with whatever Abu Dhabi does; and in Saudi Arabia it’s just too complicated to even get into. What’s important for a football audience to be aware of is the jealousy, the pettiness and the vindictiveness that characterises their feuding. The ruler of Abu Dhabi, Mohamed bin Zayed (MBZ), and the ruler of Saudi Arabia, Mohamed bin Salman (MBS), are the Gulf’s gruesome twosome, and the architects of various harebrained schemes designed to get the upper hand on Qatar. Take, for example, what the auctioneers Christie’s described as “a historic night in New York” in November 2017, when representatives of the Saudi crown prince paid a world-record $450 million for a Leonardo da Vinci painting, ‘Salvatore Mundi’. Christie’s proclaimed that the “stunning price reflects the extreme rarity of paintings by Leonardo da Vinci,” but a more amusing theory later emerged. According to “a source close to the Emirati leader [MBZ]”, MBS only paid so much for the painting – valued at $80 million – because he thought he was bidding against Qatar. It turns out he was bidding against MBZ, who also thought he was bidding against Qatar. When the Sheikhs realised their error, they swapped the painting for one of MBZ’s yachts, and that is why an overpriced picture of Jesus is now one of the main attractions for visitors to the Louvre Abu Dhabi. Saudi Arabia is unquestionably behind what Tariq Panja described recently in the New York Times as “the brazen bootlegging of a multibillion dollar sports network” whereby sources in Saudi have deployed “industrial scale knowledge and ability” backed by “multimillion dollar-funding” to tap into Qatar’s beIN Sports network and make its content free to view to anyone willing to pay the $100 for the beOutQ decoder that is now widely available in Saudi Arabia. Unfortunately, bungles and bootlegging merely provide the context for Episode 2’s darker content. “The Kids Are Not Alright” is mostly about child slavery. 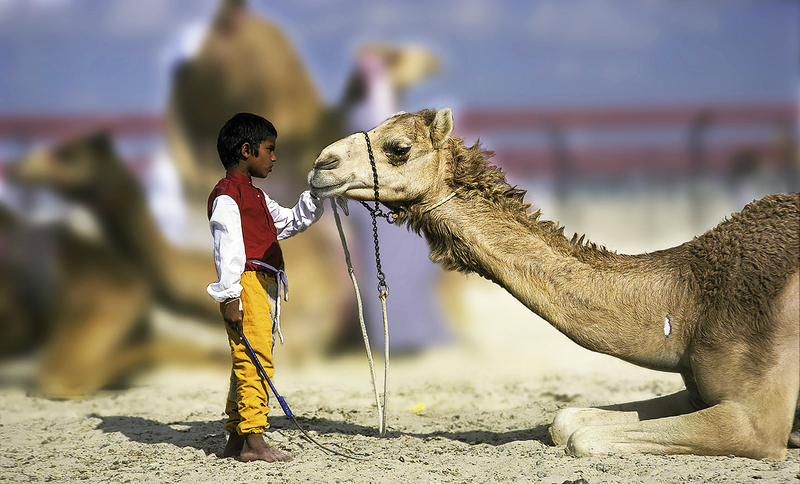 A camel jockeys ideally shouldn’t weigh more than 20 kilos. Therefore they use kids, usually between four and six years old, to ride the big animals. On May 11, 2005, then US Ambassador to Qatar, Chase Untermeyer, sent a classified cable to the State Department in Washington DC detailing his experiences at a large thoroughbred camel race meeting in Doha. Untermeyer noted the highly visible presence of the most senior members of the Qatari royal family, including the current Emir Sheikh Tamim Al-Thani. “During the fifth round, two camels were observed coming through the finish line without jockeys. When asked about the missing jockeys it was commented that the jockeys must have fallen off the camels onto the racetrack,” runs the cable, which describes seeing a total of three jockeys being taken away in ambulances that day and notes that six jockeys die every year and “many more are severely injured.” Untermeyer also noted that US Embassy staff’s attempts to interview the jockeys of these thoroughbred camels “met with resistance.” This isn’t surprising – the 800 jockeys present that day were mostly between 4 and 6 years old and they weren’t Qatari. Anyone who has spent time in Doha or Dubai or Abu Dhabi will testify that the Gulf is no longer a place one associates with a traditional, pastoral way of life. 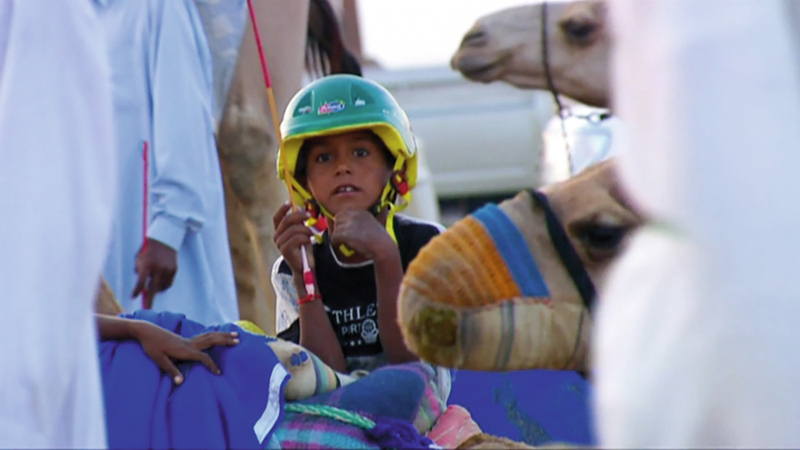 The discovery of oil in the 1950s and 60s consigned that lifestyle to history, and the camel, which had been so central to the lives of the peninsula’s bedu tribes, found itself in need of a career reboot. Enter the hejin, or racing camel, an impressive 400 kg beast capable of sustaining an average speed of 35 kilometres per hour over long distances. Previously a largely ceremonial event at bedu weddings, camel racing became an outlet for the Gulf Sheikhs’ competitive urges, and a means to display their credentials as the protectors of local culture and traditions at a time when oil money was transforming their economies and their societies irrevocably. The use of children in races can be traced back to the men behind Manchester City – the Al-Nahyan family of Abu Dhabi – and the palace they built themselves in the Rahimyar Khan region of Pakistan in the 1970s. Camel racing was one of the outdoor pursuits favoured by visitors to the palace and it did not escape their attention that the young jockeys from the area who took part in the races enjoyed a significant competitive advantage over adult jockeys – camels, unlike horses, cannot be fitted with weight-distributing stirrups, making the jockey’s weight even more critical in races. According to Save The Children, it was around this time that parents from Rahimyar Khan began to allow their children to be taken to the Gulf, often in private planes, and as the popularity of the burgeoning sport grew, fuelled by petrodollars, so did the demand for jockeys. Children from Bangladesh, India, Sudan, Mauritania were also trafficked to the Gulf, but Pakistan appears to have been the main source of child jockeys and the UAE their main destination. Save The Children estimate that 15,000 children from the Rahimyar Khan region of Pakistan alone were trafficked to the UAE between the mid-1970s and 2005. Investigations in Pakistan in 2004 revealed the existence of several highly-organized trafficking networks, comprising criminal gangs, recruiters, travel agents, law enforcement officials in Pakistan, and wealthy and powerful individuals in the UAE. Traffickers promised poor and desperate families that their children would be going to well-paid jobs and there were reports of coercive methods being used, which is to say kidnapping, when deception failed. The sport became highly competitive and highly professional to the point where the Al-Nahyan family set up a racing camel research centre equipped with operating tables that could accommodate humps, but there was a central tension at its core: the Sheikhs had to use the lightest jockeys possible to remain competitive, which meant they needed to use other people’s young children in their races, but to accrue the prestige and honour that accompanies victory, the sport had to be visible to its intended domestic audiences, which meant their exploitation of these young children needed to be very public. As a result, race meetings were meticulously stage managed and involved local music, dance, and poetry lauding the ruling sheikhs, who entered and were seated in the grandstand in accordance with their importance. If you weren’t able to attend camel races yourself, that wasn’t a problem – they were screened on local television. Footage from a 2002 race meeting in Dubai shows the most senior members of the country’s ruling elite in attendance, including Manchester City’s nominal owner, Sheikh Mansour bin Zayed Al-Nahyan. Inevitably the scale of the trafficking operation and the visibility of the problem began to attract the attention of groups like Save The Children, UNICEF, and Anti-Slavery International, and when reports of the mistreatment of the children began to emerge in the late 1990s, they made uncomfortable reading. The description of the jockeys as children doesn’t do justice to the horror of this situation. An award-winning documentary, “Sport of Sheikhs”, first aired on HBO in 2004 (and now available on YouTube) contains footage of children as young as 3 years old being strapped onto camels for training runs. The jockeys were infants. Once a child reached 20 kg he was deemed too heavy and surplus to requirements. One of many former camel jockeys I spoke to in Bangladesh in 2011 said that he was injected with anti-growth hormones to keep his weight down. 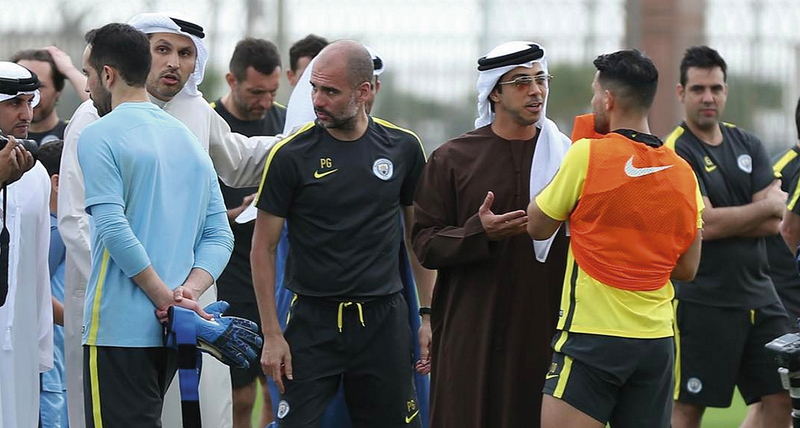 Mohammed bin Zayed Al-Nahyan is the de facto owner of Manchester City – and a big fan of camel races. Here he enjoys the company of Fifa president Gianni Infantino. The screening of the HBO documentary in the United States was a public relations disaster for the UAE and things got worse for them in September 2006 when a US law firm, Motley Rice, filed a lawsuit against the ruler of Dubai, Sheikh Mohammed bin Rashid Al-Maktoum, accusing him of child slavery. Motley Rice argued that Al-Maktoum’s thoroughbred horse-racing interests in the US provided courts with jurisdiction to hear a civil action on behalf of hundreds of former child jockeys and their families. According to the attorney who handled the case, Al-Maktoum was “gracious to the process server” who served him with the lawsuit on September 11, 2006 at the Keeneland horse sale in Kentucky, but there must have been consternation behind the scenes in Dubai and Abu Dhabi. Motley Rice had earned a reputation as, in the words of Forbes Magazine, “the most feared asbestos/tobacco/mass-torts plaintiffs law firm in the country,” and they had a wealth of evidence to support the slavery charges. The UAE’s response was predictable: they fired up the PR machine. To put it mildly, the case presented a challenge. A handful of the richest men in the world had systematically preyed on thousands of the poorest families in the world for three decades, and robbed them of their infant sons to furnish the demands of the sport they created and developed for self-promotional purposes. As if that wasn’t enough, their own TV footage provided compelling evidence of their guilt. Fortunately for them, if you’re rich enough and powerful enough, even child slavery can be spun to your advantage. To explain in full how the UAE pulled this off would require a detailed examination of some centuries-old principles of international law, so a summary will suffice here. The strategy was two-pronged. Firstly, the UAE hired UNICEF to repatriate the children and to lend their seal of approval to a rudimentary compensation scheme – $1000 for anyone you could prove he had been a camel jockey and a maximum payment of $5000 for families of children who had died or been permanently disabled. To get the cash, the children and their families had to sign away their right to seek compensation elsewhere. According to the documents that the UAE submitted as part of its defence to the lawsuit, UNICEF was also contractually obliged to “maximize opportunities for building the identity of the project as UAE funded.” An alternative way of putting this is that UNICEF were paid to publicise and promote a narrative that depicted the men responsible for the enslavement of the children as their saviours. To its shame, UNICEF abided enthusiastically by the terms of the contract. 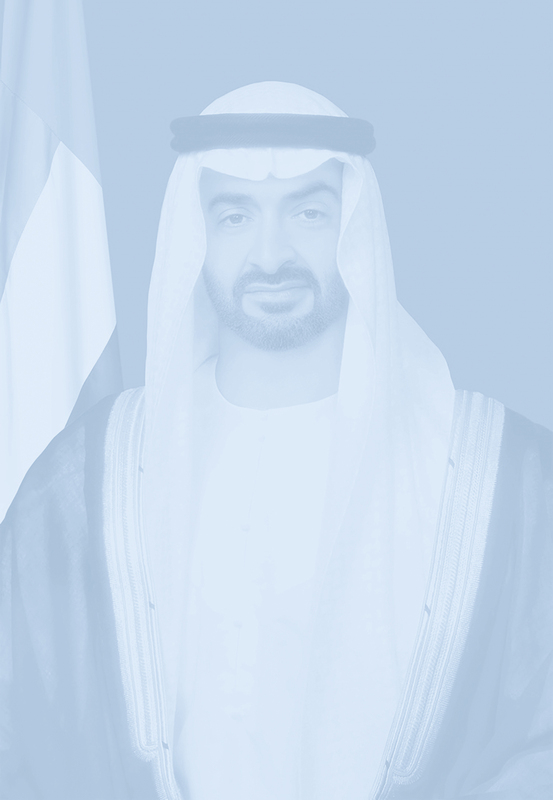 In 2007, for example, UNICEF’s then regional director for the Middle East and North Africa expressed his “earnest appreciation to the visionary leaders of UAE who made this project a long-term promise of protection and development for all affected children.” The second stage of the process was to turn up the political pressure on the US government. In a letter to then US Secretary of State, Condoleeza Rice, in which he asked that she “exert efforts” to put a halt to the “negative effects” of the lawsuit, the UAE’s Minister of Foreign Affairs, Sheikh Abdullah bin Zayed Al-Nahyan described his country as “a main partner in the international fight against terrorism.” Sheikh Al-Maktoum sent a similar message to then President George W. Bush in November 2007. The US government duly offered its support for a dismissal of the lawsuit in the terms prescribed by the UAE government. Ultimately, courts in Miami and Kentucky denied jurisdiction, nobody was ever held accountable, nobody was ever properly compensated and few media outlets, with the notable exception of HBO, ever thought it worth exploring in much detail. The lack of media coverage of the case was particularly surprising in the UK given that the filing of the lawsuit coincided with the Gulf states’ first major foray into club football – the inauguration of Arsenal’s Emirates Stadium. Emirates Airlines is owned by the government of Dubai and while its ‘Fly Emirates’ sponsorship of numerous European clubs serves a more obviously commercial purpose than Abu Dhabi’s ownership of Manchester City, or Qatar’s ownership of Paris Saint-Germain, the Emirates brand forms a central pillar of Dubai’s branding strategy. Dubai bought the naming rights to Arsenal’s stadium in 2004, making its relationship with the club deeper than its sponsorship of Real Madrid, Benfica, AC Milan, Olympiakos, Hamburg, or the New York Cosmos, but in all the hullabaloo that accompanied the official opening of the stadium in October 2006, nobody seemed to think it worthy of comment that Arsenal’s new patron was facing child slavery charges. History repeated itself two years later when the UK media failed to notice that several members of the Abu Dhabi royal family, which had just purchased Manchester City, were facing slavery charges in Belgium. A court in Brussels convicted nine Abu Dhabi princesses in absentia in that case, based on the testimony of a group of domestic servants who escaped from the Hilton Hotel and went to Belgian police. Sheikh Al-Maktoum’s involvement in child slavery, by contrast, led to him and other rulers in the UAE being lauded as visionary humanitarians. 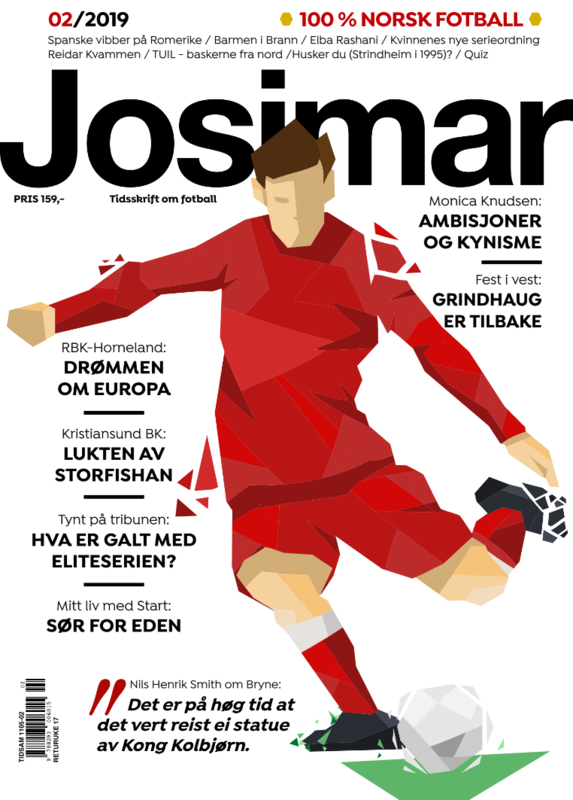 If the camel jockey story tells us anything it’s that there’s no depth to which the Gulf’s rulers won’t stoop to nor any actions they’ll consider beyond the pale as they vie for supremacy, and there is little doubt that football is now one of the key battlegrounds where their rivalries will play out. In May 2018, Tariq Panja revealed that Saudi Arabia and the UAE were behind efforts to set up a $25 billion world club championship, a move aimed at wresting control of elite club competition away from UEFA. Gianni Infantino’s efforts to push that through failed, as did his efforts to secure a piece of Qatar’s 2022 tournament for Saudi Arabia and the UAE, but the Gulf monarchs can spot an easy mark, they know that no horse’s head need be harmed in negotiations with Gianni Infantino, and you can rest assured they will be back. Qatar, for its part, will do whatever is required to host the 2022 World Cup, everything, that is, except treat more than one million migrant workers better than serfs and protect them from its life-threatening climate. So expect the Gulf states to buy and sponsor more clubs, expect them to buy more television rights, and don’t expect their quarrelling to abate any time soon. The broadening of the focus of Episode 2 might appease the anger of the Manchester City fans who feel their club has been unfairly singled out for scrutiny, but the football fans who can step back from their narrow tribal loyalties will realise that the story of the Gulf’s child slaves should serve as a cautionary tale for anyone who cares about the long-term health of the game and not just the short-term success of one club. It would be an act of folly to allow any group of petty kleptocratic patriarchs to take a controlling stake in the game, let alone a group with a very recent history of child slavery to add to their long and blood-spattered rap sheets. Unfortunately, the men whose money now props up much of elite football will feel very confident of strengthening their grip on the game. And let’s face it, if you can get away with child slavery, you can probably get away with anything, right? That concludes this sneak-preview of episode 2 of the series! Episode 3 will take a closer look at the UAE’s geopolitical clout, and will dive into the allegations that the men behind Manchester City hired a convicted child molester to illicitly funnel money to a fundraiser for US President Donald Trump, before addressing how the UAE government called in Indian special forces to kidnap a princess from Dubai who had fled the country on a yacht with a former French spy.